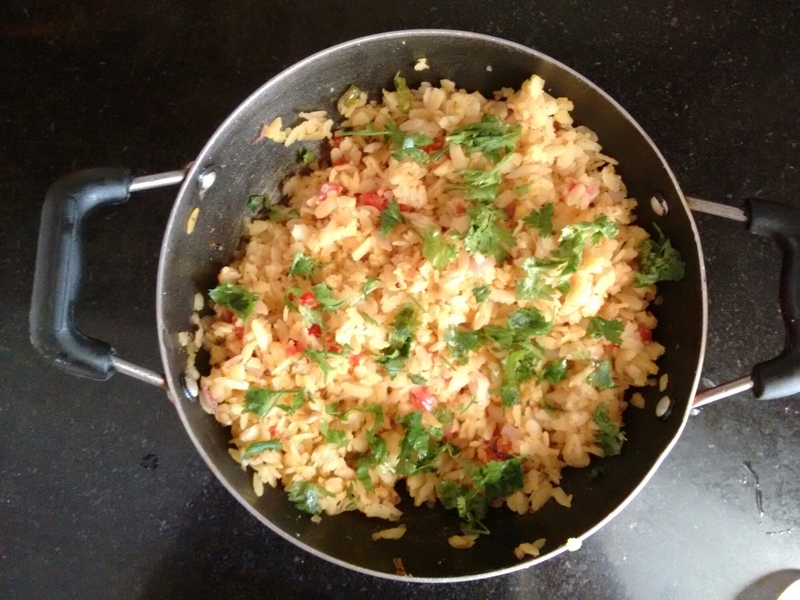 This is a popular Indian breakfast dish known as poha(savory flattened rice). It is my favorite dish to make when hunger strikes as it literally takes 5 minutes to make it. – Seave the poha(flattened rice) to remove any powder or small granules. – Thoroughly wash the poha without breaking the rice. Remove excess water. – Place the poha in a flat dish and pour 1/2 cup water over it. Let the rice soak the water for 10 minutes. – Meanwhile add the cooking oil in a pan. When the oil is hot add in the mustard seeds. – Once the seeds splatter, add in the curry leaves, green chillies and potatoes. Cover the pan for a minute. – After a minute add the chopped onions. Stir well and cover the pan for a minute. – Add in the peas and the tomatoes. Stir well and cover the pan till the vegetables get cooked. – While the vegetables simmer, add turmeric powder, red chilly powder, salt and sugar to the poha( flattened rice) and gently mix it all up. – After a minute, add the poha to the vegetables. Mix in the coriander leaves,lime juice and crushed roasted peanuts. – Let it simmer on medium flame for a minute.